Since its introduction from Asia, the brown marmorated stink bug, Halyomorpha halys (Stål), has become a pest of many agricultural crops in the USA. Insect predators utilize H. halys as prey; however, the chemical cues used by them in prey location are largely unknown. Here, we hypothesized that tridecane, an H. halys-associated volatile, acts as a kairomone for the predaceous minute pirate bug, Orius insidiosus (Say). We conducted laboratory, greenhouse, and field experiments to: (1) assess the attraction of adult O. insidiosus to H. halys-damaged bean pods and tridecane in cage studies, and its effect on egg predation; (2) video record the behavioral response of O. insidiosus males and females to tridecane in a four-arm olfactometer; and (3) test whether Orius spp. 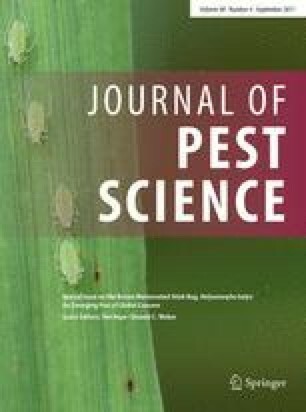 are attracted to tridecane-baited sticky traps in peach, blueberry, and sunflower fields, and its effect on egg predation. In the greenhouse, O. insidiosus was attracted to H. halys-damaged pods and artificial plants baited with tridecane in the presence of prey (sentinel eggs); however, this attraction rarely led to increased egg predation. Although both O. insidiosus males and females spent more time in the arm of the olfactometer with tridecane, males were more responsive at a lower concentration than females. Similarly, Orius spp. were more attracted to tridecane-baited than unbaited traps in the field; however, there was no effect on egg predation. Altogether, while O. insidiosus is attracted to tridecane, this attraction did not always lead to higher predation, suggesting that this kairomone likely acts as an arrestant. Thanks to Big Buck Farms (Hammonton, NJ) for providing blueberry sites for this study and to Robert Holdcraft and Jordano Salamanca for assistance with volatile collections, olfactory assays, and data analysis. We also thank Kris Dahl, Charles Corris, Gabrielle Pintauro, Manuel Chacón-Fuentes, and Caryn Michel for their help with insect colony maintenance and field sampling, and Johnattan Hernández Cumplido, Elvira de Lange, and two anonymous reviewers for critical reading and comments on an earlier draft of the manuscript. Funding for this project was provided by USDA NIFA SCRI Grant #2011-51181-30937, multi-state hatch projects #NJ08270 and #NJ08225, a hatch project #NJ08192 to CR-S, and a scholarship from the Conselho Nacional de Desenvolvimento Científico e Tecnológico (CNPQ, Brazil) (Process Number: 164869/2014-0) to DFF. This study was funded by USDA NIFA SCRI Grant #2011-51181-30937 to GCH, ALN, and CR-S, multi-state hatch Projects #NJ08270 and #NJ08225 to CR-S, GCH, and ALN, a hatch Project #NJ08192 to CR-S, and a scholarship from the Conselho Nacional de Desenvolvimento Científico e Tecnológico (CNPQ, Brazil) (Process Number: 164869/2014-0) to DFF. All applicable international, national, and/or institutional guidelines for the care and use of animals were followed. This article does not contain studies with humans participants performed by any of the authors.